Let's look at the normal reactions to pregnancy, then at how abortion facilities use these perfectly normal, time-limited reactions to sell abortions. For many women, accepting (or coming to terms with) the pregnancy will usually involve a mixture of positive and negative feelings about accommodating a new person in their lives. Some women will question their readiness to start a family (will there ever be a right time?). Others may focus on their own personal issues and/or family values, as they wrestle with the whole picture of being pregnant. .... Life-changing events (such as pregnancy) frequently involve immense emotional experiences and release (both positive and negative) and it is very normal to feel different at various times, as you go through this period of adjustment. Thus we seen at merely accepting the fact that she's pregnant is something many pregnant women go through. But both prochoice writings, and "counseling" at abortion facilities as reported by women, treat this as a way to leverage abortion sales. They use statements like, "It will be as if this never happened," and other reassurances that an abortion will make the whole situation of being pregnant simply go away. Negative feelings are also treated as evidence that the woman will continue to reject the pregnancy, and ultimately reject the baby. they use statement like, "This will enable you to have a baby when you're ready." 1. They take something normal -- needing time to adjust to the idea of being pregnant, initial negative feelings -- and treat it as a reason to abort. This normal stage of pregnant is treated as evidence that the woman is "not ready" to parent. 2. The push for "early abortion" produces an encouragement to rush into abortion immediately, before the woman has had adequate time to process the news. This is akin to helping a person who has just suffered a disabling injury to commit suicide during the stage of initial shock. 3. The initial and normal negative feelings about the pregnancy are treated as if they're signs of permanent inability to be happy about the impending birth of a child. Shocked, scared, and unsure: "Discovering a new pregnancy when it has not been talked about or planned (or even when the pregnancy was intended) may bring up feelings of being shocked or overwhelmed. These are very common, immediate reactions, which can also be accompanied by feeling anxious and perhaps scared, frightened, confused and/or angry. Being pregnant when you did not intend to be can also trigger feelings of being 'out of control' and possibly feeling 'at the mercy' of your pregnancy's destiny (in a sense)." Anxious or concerned, teary or moody: "Many women will go through the early weeks of their pregnancy feeling anxious or concerned at different times. The reasons for this may be rational, or they may be totally illogical (all being very normal)." Think about how dishonest and underhanded it is to use these normal reactions to convince the public that abortion is a "need." What's more, think about how cruel it is to reinforce the woman's normal negative feelings as a means of getting an abortion sale. Even the most rudimentary informed consent about surgery involves telling the patient whether or not the symptoms will resolve on their own. But in abortion, this isn't done. Imagine how outraged we would be if doctors were performing tonsillectomies to treat a tonsil infection that could be treated with antibiotics. Imagine the outrage if doctors routinely performed joint replacement surgery for reactive arthritis -- which typically resolves in three to 12 months. But because of politics, doctors routinely perform drastic, permanent surgery to treat the normal, self-limiting ambivalence of early pregnancy. We need to expose this inexcusable and cruel practice at every opportunity. Since we have no anniversaries today, I will address a death that we don't have a specific date for. Amidst the coverage of Edith Green's death is a news snippet noting that Dr. James P. A. Nolan was arrested for the criminal abortion death of 18-year-old Lillian McCullough. According to one article, within three hours of Lillian's death, "the police had arrested the physician and Richard A. King, 21, and Mrs. Abbie M. Graham, 37, both of Waltham, as accessories." One more note: Lillian's abortion was typical of pre-Roe abortions in that it was performed by a physician. According to pre-Roe research, roughly 90% of pre-legalization abortions were performed by doctors. Legalization wouldn't stop these doctors from performing abortions. In fact, logic tells us that they'd preform more abortions, since they could advertise openly rather than depending on word of mouth for referrals. If, as abortion advocates sometimes argue, pre-legalization abortions were often performed by sub-standard doctors, that means that these quacks would be preforming even more abortions, while remaining quacks. But the fear of being arrested is now gone, reducing the quack's motivation to take care not to injure his patients. The consequences of this increase in patients and elimination of the fear of being arrested are predictable. There are three abortionists I know of who had clean records -- no patient deaths -- as a criminal abortionist, only to go on to kill two patients in his legal practice. They are Milan Vuitch (Georgianna English and Wilma Harris) and Jesse Ketchum (Margaret Smith and Carole Schaner), and Benjamin Munson (Linda Padfield and Yvonne Mesteth). So much for the idea that legalization would reduce abortion deaths. 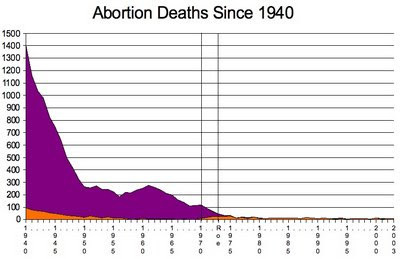 In fact, if we look at abortion mortality in the 1940s, while abortion was still illegal, there was a massive drop in maternal deaths from abortion. The death toll fell from 1,407 in 1940, to 744 in 1945, to 263 in 1950. If you look at the points where abortion was legalized in New York and California, and the point where Roe v. Wade was handed down, you see no change in the trend. Most researches attribute the plunge prior to legalization to the development of blood transfusion techniques and the introduction of antibiotics. Legalization, by increasing the overall number of abortions and encouraging more quackery, simply replaced the illegal abortion deaths that would have taken place with legal abortion deaths. Those who advocate legalization purely as a public health measure, therefore, are mistaken in their assumptions. 1. "Who will adopt all those unwanted children?" or "Are you going to adopt all those unwanted children?" 2. "It's better to abort a fetus than to doom a child to a life of being unwanted." or "Those unwanted children will grow up to be criminals/unsuccessful/depressed." 3. "Why should a woman be forced to bear an unwanted child?" 1. Every child is wanted by somebody, and could be placed for adoption. 2. Your humanity is not determined by whether or not somebody else wants you. Granted, both of these are valid assertions, but they fail to address the underlying assumption. By simply allowing the abortion advocate to put forth, totally unchallenged, the idea that an unaborted child is unwanted is to allow them to assert lies. Our job as life advocates is to combat lies. The first thing we need to do is to simply point out the fallacy: "Where is your evidence that if a woman doesn't get an abortion, the child will be unwanted?" Because people -- particularly supporters of legal abortion -- are so accustomed to making the unwantedness assertion, it's likely that the life advocate will be challenged to present evidence that an unaborted fetus is, indeed, not unwanted. Fortunately, there is an abundance of evidence to bring to bear. 1. The abortion advocates' own dismissal of adoption as an option. If, as they claim, abortion merely prevents the birth of an unwanted child, why is it so difficult for a birth mother to make an adoption plan? If the child was unwanted at birth, as abortion supporters claim it would be, then the mother would be able to gratefully hand over the onerous burden without a backward glance. 2. Abortion advocates' own defense of late-term abortions. Stories such as the ones on this page repeat again and again in order to use these women as human shields. By putting forward women who aborted wanted babies because of prenatally-diagnosed conditions, they're also undermining their own argument that every baby targeted for abortion is unwanted. We also need to nail them on this and ask why they're facilitating abortions women don't want, rather than offering palliative services such as perinatal hospice. 3. Evidence from women being pressured. You can use stories from sites like Be Not Afraid to underscore how hard women are being pressured to abort wanted babies. Bring up cases like Marla Cardamone (pictured) and Allegra Roseberry who died after being bullied into unwanted abortions, and ask the abortion advocates how it can be, if being prochoice is all about letting the women make the decisions, prochoice groups aren't up in arms about how these women are being treated. 4. Evidence from women who changed their minds after an abortion failed to kill the baby. After all, if the baby really is unwanted, wouldn't the mother remain firm in her desire to get rid of it after it survived an abortion attempt? 5. Evidence from post-abortive women. There is an abundance of evidence from both sides that many aborted babies are wanted by their mothers at the time of the abortion, but the mother feels trapped or is being coerced. Stories like Shawn's Story from an abortion advocacy site, or stories like this one from prolife sites, are examples. It's best if you use the stories of women who remained committed to abortion even though they themselves felt pressured or trapped into aborting wanted babies, because it's harder for the abortion advocate to dismiss those stories. These stories serve double duty because they also let us tackle "hard cases" head on and ask how helpful these abortions really are. See Ashli McCall's story as well. 6. Evidence from research into the normal psychology of pregnancy. Even many abortion supporters, such as Planned Parenthood's Mary Calderone, noted that ambivalence and even rejection are normal in early pregnancy, and tend to resolve on her own if the mother is given support and a chance to bond. In short, while there is nothing wrong with pointing out that being "unwanted" doesn't make you any less deserving of protection from people who want to kill you, and that every baby is wanted by somebody, those two points are not enough. We need to shoot down the unwantedness presumption at every opportunity. On July 29, 1949, Dorothy Martin went to the home of P.D. Beigun for an abortion. Dorothy, with the assistance of a man named Virgil Echols, had vistied Beigun a few days earlier to make the arrangements. About 15 minutes after the abortion began, Dorothy lost consciousness. To their credit, Beigun and Echols called an ambulance, as well as police, before concocting their cover-up story. When the police arrived, Dorothy was dead. The next day an autopsy revealed that Dorothy's cervix and uterus had been damaged, and that Dorothy had gone into shock and died within a few minutes of her injury. Dorothy had been in good health, with no abnormalities of her heart, lungs, or kidneys and no history of fainting. The fetus, which appeared to be about three to four months of gestation, was removed, along with Dorothy's damaged uterus, to be presented as evidence of Dorothy's pregnancy, gestational state, and injuries. In trial, it came out that Echols had previously brought his own wife to Beigun for an abortion, and she had nearly died. 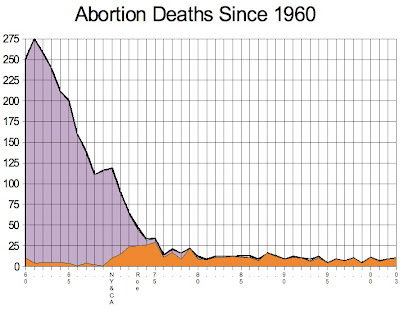 During the 1940s, while abortion was still illegal, there was a massive drop in maternal mortality from abortion. Most researches attribute this plunge to the development of blood transfusion techniques and the introduction of antibiotics. Learn more here. Even though advances in medicine had reduced abortion deaths significantly even prior to legalization, women continue to die, often due to sloppy abortion practices. Twenty-six-year-old Yvette Poteat, for example, had an abortion performed by Dr. Marion D. Dorn Jr. at The Ladies Clinic in Charleston, South Carolina on July 16, 1985. A lawsuit filed by her surviving mother and sister says that Dorn did not examine the tissue he removed from Yvette's uterus, and did not notify Yvette that the lab report showed no fetal or placental tissue in the specimen. Early in the morning of July 29, Yvette collapsed at home. She was taken by ambulance to the hospital. She went into cardiac arrest due to a ruptured ectopic pregnancy that both Dorn and the hospital staff had failed to diagnose, and was pronounced dead 6:15 a.m.
Today's anniversaries. Was race a factor? On July 28, 1928, 21-year-old Maud Thurmond died in Chicago of sepsis from a criminal abortion performed that day. Maud's race is first given as "colored" then as "white - American Indian." Either way, it's apparent that she was a member of a minority group, which might explain in part why nobody was ever held accountable for Maud's death. We still see that same sort of racism today. Holly Patterson's abortion death was a national story, generating outrage and Congressional attempts to pass a law addressing the bad behavior that led to her death. Meanwhile, despite the greater culpability of Laura Hope Smith's killer, there was no similar reaction to the death of this young Honduran-American woman, even though both families tirelessly worked to raise awareness after their daughters' deaths. Charisse Ards is one of the women Life Dynamics lists on the Blackmun Wall of women killed by safe and legal abortion. Life Dynamics indicates that Charisse was 20 years old, single, and a mother of one. According to Life Dynamics, Charisse died July 28, 1989, from a pelvic infection after a legal abortion. With so little information, we can't assess the abortionist's culpability in Charisse's death. I thoroughly enjoyed being on Life Report last night, and it's given me a ton of stuff to reflect on and address. I'll be getting to these points over the next days and weeks. "Unwantedness." Why do we let the abortion advocates equate picking up the phone to schedule an abortion with "This baby is unwanted"? But we do. We go barreling head-on into, "Well, somebody wants that baby. Why doesn't she make an adoption plan?" Prochoicers themselves undermine their whole "unwanted baby" claim every time they attack adoption on the grounds of how hard it is to give up a child. Well, if an unwanted pregnancy really meant an unwanted baby, she'd hand the kid over with never a tear, only a huge sigh of relief. The fact that placing the baby for adoption is such an agonizing thing is predicated on the reality that by the time the baby arrives, it usually is wanted -- by the mother who considered aborting it in the first place! Why do we let them get away with that? Start thinking about how the way we let prochoicers frame the abortion issue utterly fails to challenge them on these points. Yes, they exist because abortion advocates in positions of influence or power consider the well-being of the victimized women to be of less concern than the overall legality and "access" picture. The average prochoicer on the street does not share that cavalier attitude. We do best, therefore, to not only point out how nasty these places are, but the total complicity of abortion supporters. But even more, we need to make it very plain that prochoice organizations from whom prochoice citizens get their information -- the organizations that they trust -- have been lying to them about how trustworthy abortionists are. Raise the question of how trustworthy they are about other things, if they're so cavalierly willing to lie through their teeth about the existence of Kermit Gosnell types. Also, the flourishing of seedy abortion mills will totally work in abortion advocates' favor when Roe falls. They will just point to the very practitioners that they were ignoring when abortion was legal, and blame the situation on us, when it's a situation that they practically promoted and cultivated in the first place. Well, time to leave for work. Chew on these things and let me know what you think. Four deaths. Are only two tragic? Twenty-five-year-old Lizzie Cook, a farmer's daughter, died suddenly on July 27, 1884, in Lockport, New York. The newspaper noted that "the secrecy in getting her body removed to her home created suspicion." Lizzie's body was exhumed for an examination, which showed that she had died from an abortion. Dr. Ira T. Richmond was arrested. Richmond had come to Lockport a year earlier and opened a sanitarium, "which died for want of patronage." Evidently, just has has been the pattern after legalization, being a failure as a regular doctor has long been a factor in the decision to become an abortionist. On July 27, 1920, 38-year-old Adelaide Fowler died at her Chicago home after a criminal abortion. Dr. Barney Welty was arrested, and indicted by a Grand Jury on August 1, but the case never went to trial. Eighteen-year-old Yvonne Mesteth was in the second trimester of her pregnancy when she went to Dr. Benjamin Munson's Rapid City practice for an abortion. Yvonne developed an infection, then went into kidney failure and adult respiratory distress syndrome, which killed her on July 27, 1985. Despite having already killed Linda Padfield, Munson had been welcomed into the National Abortion Federation. He is also the third former criminal abortionist I've learned of who had a clean record -- no patient deaths -- as a criminal abortionist, only to go on to kill two patients in his legal practice. The others are Milan Vuitch (Georgianna English and Wilma Harris) and Jesse Ketchum (Margaret Smith and Carole Schaner). Thirty-two-year-old Mary Ann Dancy was a mother of five when she went to Fleming Center in North Raleigh, North Carolina for a safe and legal abortion on July 27, 1990. The abortion was performed by Clarence J. Washington. He documented no complications. After Mary Ann went home, she bled heavily, and the next day, July 28, she was taken to Halifax Memorial Hospital. She died that night during emergency surgery from hemorrhage due to a lacerated cervix. I would ask abortion supporters why the deaths of Lizzie and Adelaide were unacceptable tragedies that we needed to totally revamp society to prevent the likes of, whereas the deaths of Yvonne and Mary Ann can be shrugged off as, "Well, all surgery has risks." On July 16, 1929, Dr. Sven Windrow performed an abortion on 19-year-old Emmy Anderson at a Chicago location. Emmy died on July 24. Dr. Windrow was held by the coroner on July 25. Jacque Lagrave, age 67, was held as an accessory. Windrow was indicted February 6, 1929 for felony murder. Emmy's abortion was typical of illegal abortions in that it was performed by a physician. Today's first death is one I have very little information about.On July 23, 1915, 26-year-old Mamie W. Arkins died in Chicago after an abortion performed by an unknown perpetrator. Our second anniversary is also pre-Roe, but I have much more information. Erika Peterson, age 28, died July 23, 1961 during a legal abortion at Scripps Memorial Hospital in La Jolla, California. At this time, abortion was only legal in California if it was done to save the life of the mother. Erika had entered the hospital on July 11, 1961 during the first trimester of pregnancy, because of problems breathing. She was diagnosed with pneumonia and placed in a tank respirator. Her physicians made the decision to abort her child as soon as she was well enough to undergo the abortion. On July 21st, Erika's condition was improved, and her husband signed the consent form for the abortion, which was scheduled to take place two days later. Erika went into cardiac arrest during the abortion and was unable to be resuscitated. The abortion that was intended to save her life ended her life instead. After autopsy, it was believed that Erika's original illness was caused by a hereditary disease that was exacerbated by the medications she was taking for her schizophrenia. Allegra Roseberry was pushed into an abortion in order to obtain experimental cancer treatment. Anjelica Duarte sought an abortion on the advice of her physician, and ended up dying under the care of a quack. Barbara Hoppert died after an abortion recommended due to a congenital heart problem. Christin Gilbert died after an abortion George Tiller holds was justified on grounds of maternal health. "Molly" Roe died in 1975 when her doctors made the dubious decision to perform a saline abortion to improve her chances of surviving a lupus crisis. On July 22, 1974, twenty-two-year-old Carole Wingo died of a Demerol over dose during a safe and legal abortion at Mercy General Hospital in Detroit. Despite the name, Mercy was not a general hospital. It was an abortion hospital. It was also a hospital in big trouble even before Carole's death. The Michigan Public Department of Health had cited Mercy for 43 violations of nursing standards and 12 violations of physical plant standards in October of 1973, and had withheld their license. Among the violations were that the operating room lacked a cardiac monitor, a resuscitator, and a defibrillator. Carole's mother filed suit against the facility and doctors David Northcross, Chuk Nwokedi, and Robert Wolf. Abortion champions will claim that as unfortunate as Carole's death is, their efforts have prevented even more deaths by achieving legalization. As you can see from the graph below, abortion deaths were falling dramatically well before legalization. This steep fall had been in place for decades. To argue that legalization lowered abortion mortality simply isn't supported by the data. On July 18, 1918, 18-year-old Margaret Smith, an unmarried clerk, died at Allegheny General Hospital in Pittsburgh. The coroner determined that she had died of septicemia from a self-induced abortion. According to pre-Roe research, self-induced abortions were unusual, accounting for perhaps 2% of abortions. Barbara Riley (identified as "Sheryl" on the Life Dynamics "Blackmun Wall") was 23 years old when she chose abortion. She had a history of sickle cell anemia and three previous term pregnancies -- two live births and a stillborn child. She was in her first trimester of pregnancy when she underwent the abortion on July 11, 1970 at Harlem Hospital. The abortion had been recommended by hospital staff because Barbara had a history of sickle cell disease. The abortion would probably have been recommended as beneficial to Barbara's health, even under New York's old abortion law. Instead of improving, Barbara's health deteriorated. Her blood started to break down. Nine days after the abortion, July 20, Barbara died. The other women I've identified as dying from sickle cell crisis triggered by an abortion are Margaret Davis and Betty Hines. Maternal mortality in general (and abortion mortality with it) fell dramatically in the 20th Century, decades before Roe vs. Wade legalized abortion across America. Abortion advocates, however, decietfully credit legalization for this public health success. Very little is on record about the death of 17-year-old Gertrude Wynants. According to the New York Times, Gertrude died on July 19, 1925, of a criminal abortion. Mrs. Margaret Shott Higgens, age 23, was indicted for manslaughter in Gertrude's death. The death of Carmen Rodriguez more than four decades later drew far more attention. Carmen was 31 years old when she underwent a 14-week saline abortion at Lincoln Hospital in New York City in July of 1970. She had a history of rheumatic heart disease and two previous live births. After the saline was injected, it got into Carmen's blood stream. This caused acute pulmonary edema -- fluid accumulation in the lungs -- and Carmen went into a coma from which she never recovered. She died on July 19, leaving behind a husband along with her children. After Carmen's death, a militant Puerto Rican group, The Young Lords, swung into action. They pointed out that doctors at Lincoln Hospital knew that Carmen had heart problems and failed to take proper precautions -- a very valid claim. After all, saline abortions had long been known to be risky to the woman's heart. What responsible physician would choose to perform an abortion on a heart patient, using a technique that has been documented as potentially causing heart-damaging electrolyte imbalances? The Young Lords distributed leaflets in the neighborhood of the hospital, denouncing Carmen's death as "murder". For 12 hours, the group occupied an administration building connected with the hospital, denouncing the hospital as "a butcher shop that kills patients". Merle Goldman, spokeswoman of an abortion advocacy organization, did not share The Young Lords' outrage. Ms. Goldman said she hoped that Carmen's death wouldn't deter other women from undergoing abortions. She touted abortion's reputed safety and stressed that her group was lobbying against proposed health department regulation of abortion practice. New York City Chief Medical Examiner Milton Helpern, on the other hand, expressed concern that ill-equipped and poorly-staffed freestanding abortion facilities were posing a danger to women. Finally, a case where less blame can be placed on the doctor. Betty Hines was 21 years old when she was checked into Doctors Hospital in California for a safe, legal abortion to be performed by Dr. A. Mitchell on July 19, 1971. Mitchell had been her physician for three or four years. There didn't seem to be anything wrong during the procedure. Betty was transferred to the recovery room, when she suddenly went into cardio-respiratory arrest. Mitchell theorized that perhaps Betty had died because of a bad vial of Inovar, because the next patient who was injected from that vial also went into cardiac arrest but was successfully resuscitated. Betty's autopsy, however, found no trace of Inovar in her system. A toxicology check was also done on the vial of medication, and found nothing wrong with the Inovar. Betty's death was attributed to massive intravascular sickling due to underlying sickle cell disorder. Other women who died of sickle cell crisis triggered by abortion include Margaret Davis and Sheryl Roe. I have been unable to determine if abortionists warned each other of this potentially lethal pitfall and took actions to be ready to treat it should it strike again. Today we'll move backward in time. Twenty-year-old Gail Ann Vroman had a safe and legal abortion performed on July 14, 1979, by New York abortionist Taskin Ratharathorn at Ft. Wayne Women's Health Organization. Within two hours, Gail was transferred to a nearby hospital. Gail died of massive infection on July 18. The coroner ruled that the death was caused by clostridium perfringens, or "gas gangrene." On the very same day that Gail died, Geneva Calton, age 21, mother of two, underwent an abortion at Northside Family Planning Service in Atlanta, Georgia. On the drive back home she was in pain, but she figured that this was just the cramping the clinic had told her to expect. At 8:30 that evening, Geneva was admitted to a hospital, with no vital signs detected. Doctors attempted to resuscitate her, to no avail. She was pronounced dead. The autopsy found that Geneva's uterus had been perforated. She had bled to death. The clinic where Geneva's fatal abortion was performed seems to be the same clinic where Catherine Pierce underwent her fatal abortion in 1989. On July 17, 1917, 34-year-old Frances Reenaarot died at Chicago's County Hospital after an abortion perpetrated that day by Dr. A. E. Thomas. Though he was held by the Coroner, he was never tried "for want of pros," which I'm reading as "for want of prosecution" -- nobody felt like going after the guy. Death at the hands of a medical professional, rather than a layman, was typical for pre-Roe abortions. I have significantly more information on today's other death. Though he was not a physician, Lucy had a listing in the telephone book reading "Dr. Otto C. Lucy". Albert admitted that he had purchased some abortifacients, which had not had their desired effect. He went to Lucy's apartment in June, thinking that Lucy was a doctor. He told him that Goldie was pregnant and that they didn't want the child. He also told Lucy that he had no money, and Lucy said that he couldn't do anything for him. But on July 2, Lucy went to the Crow home at dusk and performed an abortion on Goldie. At some point that evening he called a nurse, Mrs. Ruth Bowen, to assist him. Some time afterward he returned to check on Goldie, found her condition improved, and recommended that she drink fruit juices and plenty of water. Over the next few days, Goldie's condition deteriorated. Albert called Lucy, who said he'd done all he could for her and told Albert to take his wife to a hospital. Albert called the family doctor, who also said to take Goldie to a hospital. Albert called a taxi and did so. But despite the efforts of doctors there, Goldie died. During the investigation into Goldie's abortion, police found surgical instruments wrapped in a towel and bloody newspaper, stuffed into a garbage can in the basement of the apartment building where Lucy lived. Lucy was sentenced to 25 years in the state penitentiary for Goldie's death. It's also important to keep in mind, when reading about these deaths, that mortality from all manner of injuries and sicknesses was more common in the days before widespread blood transfusions and antibiotics. In fact, due to improvements both overall health and medical care, maternal mortality in general (and abortion mortality with it) fell dramatically in the 20th Century, decades before Roe vs. Wade legalized abortion across America. If you look at the graph, you can clearly see the lack of any change in mortality trends with the advent of widespread legalized abortion. So why, pray tell, do advocates of legalized abortion get away with claiming credit for a precipitous drop in maternal deaths decades before they got their wish for abortion on demand? Inquiring minds want to know. First, that rare case: a fatal self-induced abortion. Note that in typical early 20th-century fashion, when she got married, they took away her first name. She stopped being Susan or Agnes or Betty and became Mrs. John. Mrs. John A. Morris of Jacksonville, Illinois, died at 3:00 the morning of July 16, 1903. An investigation found that she had tried a do-it-yourself abortion with an instrument given to her by a friend, belle Osborne. The abortion had caused septic peritonitis that took Mrs. Morris' life. She was about 29 years old, and left two children motherless. Next, we have a far more typical pre-legalization abortion: one performed by a doctor. Catherine probably never married, so she was permitted to keep her first name. On July 16, 1913, 24-year-old Catherine Sartelopoulos died in Chicago, at the scene of an abortion perpetrated that day by Dr. Paul Ackerman. Ackerman was arrested and held by the Coroner for murder on August 8. Spiros Glambedakos was arrested as an accessory. Dr. Jacques Moses was also arrested in connection with the case. Finally, we move into the new and improved era of legalized abortion, where horrible death is a thing of the past. Or so we're told. Little is known of 21-year-old Linda Lovelace of Tennessee. According to her death certificate, she underwent a safe and abortion on June 14, 1980. The death certificate does not say where, or who performed the abortion. It does say, though, that her uterus was perforated. As a result, Linda developed sepsis and went into shock. She died on July 16, 1980. On July 14, 1921, 23-year-old Mrs. Edna Rohner died at Illinois Masonic Hospital in Chicago from an abortion perpetrated by Dr. Otto Klemmick. He was held by the coroner and tried, but acquitted on June 12, 1923. The source document doesn't say why. Prolifers who want to keep abortionists locked up after Roe falls need to investigate these cases and prepare to plug up the loopholes in the laws. On July 12, 1889, Annie Doran, from Cadlock City, Michigan, was found dead in her room from an illegal abortion performed that day. The crime scene was described as a "Medical facility", with the additional notes, "Midwife, Abortion place" and "Clinic (e.g. abortion facility)". The database notes that both Annie and the person arrested for her death were white, and that they were not related. The abortionist's name and profession are not given. "Judy" is one of the women Life Dynamics identifies on their "Blackmun Wall" as having been killed by a safe and legal abortion. Judy was a 42-year-old mother of four from upstate New York when she chose safe and legal abortion in 1970. She was to have a tubal ligation done at the same time. Judy underwent the procedure, but went into cardiac arrest. Her heart was started again, but she remained in a coma for six days until her death on July 12. Bad Boy Brigham's "Not my clinic!" in trouble again. Okay, he's no Kermit Gosnell, but he ain't exactly Marcus Welby, either. I'll share bits of the May 26, 2011 state inspection report from Steve Brigham's Allentown Medical Services. Review of the Patient Safety Meeting minutes for the March 16, 2011, meeting consisted of the following: "There is no report of an incident or event at this time. No investigations and actions needed at this time. Upon review, the quality of patient safety is fine at this time. None at this time (regarding recommendations to eliminate future incidents and serious events). No incidents or serious events at this time." Really let that seep in. What are you getting? Because to me, that's part man-smell, and the other part is really bad man-smell. I don't know why, but overall it just smells like the color brown. Your thoughts? Where am I going with this? I'm going further into the report. I just wanted the fact that the patient safety folks rang out the "All is well!" Now let's move on, shall we? The health department inspectors seemed to agree more with the "really bad man-smell" than with the "A-OK!" Based on a tour of the facility on May 26, 2011, and interview with staff, it was determined that the Allentown Medical Center failed to maintain a safe and sanitary environment. The health inspectors looked at the "sterilized" instruments stored in the procedure rooms, ready to use on patients. They found "sterilized" instruments dumped into drawers and plastic bins. These surgical instruments had an of accumulation brown debris in the hinge areas and brown staining on the inside of the packages. Interview with EMP1 at the time of the observation confirmed the brown debris in the hinges of the surgical instruments and the brown stains on the inside of the surgical packages. EMP1 also confirmed that these surgical instruments were considered sterile and ready for patient use. Looks like Flynn nailed it with the color brown, nu? Though "brown" isn't enough to touch on the expiration dates that were as much as eight years out of date. The Recovery Area was an open room containing three black vinyl recliners for patients. There were no curtains between the chairs to provide patient privacy during recovery. The seat of the middle recliner and the left arm of the chair were were repaired with black duct tape. The chair immediately to the right had three areas on the seat of the chair where the white stuffing underneath was showing thru. .... There were blankets and pillows in the Recovery Area for patient use. Each of the patient recovery chairs had a heating pad covered with a removable blue covering. EMP1 confirmed that laundry of these patient care items, the pillows, blankets and heating pad covers, was completed by staff who took them home to launder "every once in awhile". The Snugly Duckling is starting to really look like a five-star joint in comparison. There was a freezer in the scrub room which was identified by EMP1 and by signage as "Infectious Waste". EMP1 opened the freezer. There was multiple areas of a brown red frozen splatter and smear marks on the inside door of the freezer, on the rubber gasket (seal) between the freezer door and the freezer and on all sides of the interior of the freezer. There was also a thick layer of this brown red frozen material on the bottom of the freezer. EMP1 identified this brown red frozen material as frozen blood. There was a suitcase stored under the counter. EMP1 opened the suitcase. There was a musty odor. Review of the contents of the suitcase revealed instruments wrapped in blue sterile packages with parts of the surgical instruments protruding through the wrap. EMP1 confirmed the musty odor of the suitcase and that the instruments were protruding through the blue wrap. EMP1 also confirmed that these instruments are considered sterile. One can almost hear Brigham's marketing people. "Don't worry. Very quaint place. Perfect for you." Brigham doesn't exactly own or operate the abortion mills in question, the way a puppeteer doesn't exactly move a puppet. After all, it's the strings that move the puppet, right? On October 11, 2006, AMA hired an office manager for its Pittsburgh office named Mary Grover who held herself out to be a licensed practical nurse (LPN), and indicated that she held a Pennsylvania license. She provided AMA with a license number that belonged to a different person named “Mary Grace Glover”. While employed by AMA, she assisted a physician on occasion when he performed abortions and administered anesthesia; she occasionally worked in the recovery room and oversaw the patients in the recovery room including monitoring their color, pulse, and blood pressure; and she prepared notes that she signed as the recovery room nurse. Mary Grover tendered her resignation to AMA in January of 2007. The improper health care services provided by Mary Grover were not reported to either the appropriate licensure board or any patients as required by the Settlement Agreement. In short, they hired an RN who was no longer licensed and who was passing herself off as a licensed LPN by using the license number of a woman with a similar name. This unlicensed person was assisting with abortions, administering anesthesia, monitoring patients in recovery, and signing off as a nurse. Brigham's complaint, as near as I can decipher it, is that it's unfair to smack him down for hiring a woman who was using another nurse's license because "the Department was engaging in selective enforcement of its regulatory authority because they were abortion providers, in violation of their rights and the rights of women seeking abortions." Got that? Smacking down Brigham for having an unqualified person acting as a nurse is "a violation of ... the rights of women seeking abortions." I'd like to meet the women who really argue that they have a right to have unlicensed nurses assisting in their abortions. Show of hands, people? Note, also, that the woman hired as an office manager was assisting with abortions and overseeing the recovery room. By the way, am I the only person to think that Brigham has a bit of a Ted Bundy thing going? 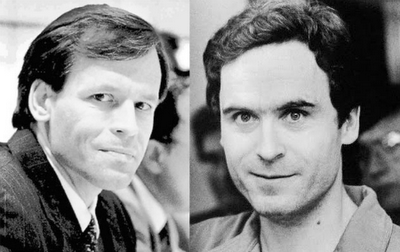 And if you can't tell which one is Brigham and which one is Bundy, I think I've made my point. Make what you will of today's anniversaries. I'm feeling unwell and thus in an ill mood to try to tie them together with a coherent narrative or such. 1919: Marie Oganesoff, wife of the Russian Attache in Washington during WWI, died on July 11, from complications of a criminal abortion performed on July 5 by Dr. Julius Hammer, father of industrialist Armand Hammer. Hammer, a 1902 graduate of the College of Physicians and Surgeons, reported used instruments on her. She had been about one month pregnant. It's a twisted and sordid story and you can read the whole thing by clicking on Marie's name. At least she wasn't identified as "Mrs. Russian Attache." 1975: Beverly Ann Moore, age 15, died July 11 after an abortion by Tuckey Hayes at Chattanooga Women's Clinic -- the "Lime 5" clinic. Hayes assured Beverly's parents that she would be "all right" just fifteen minutes before she died. Chattanooga Women's Clinic was written up for continued deficiencies even after Beverly's death. Click on Beverly's name for the whole litany of sloth. 1998: How much safer can you get than in a women's & children's hospital? Virginia Wolfe, age 33, was pronounced dead on July 10, 1998. The wheels were set in motion when Virginia went to Methodist Women's and Children's Hospital on July 6, 1998, to have an abortion performed by Dr. Lillian Jones. Jones performed a suction abortion. During the procedure, she punctured Virginia's uterus and bladder. Virginia suffered massive hemorrhage, losing so much blood that her heart stopped. Doctors repaired her bladder and removed her uterus, but Virginia's brain had already been damaged by the lack of oxygen. 1934: Boyfriend off the hook. So who killed Marian Mills? In 1934, pretty Marian Mills, a beauty queen, was the 19-year-old "campus sweetheart" of Neal Myers. Myers, a 21-year-old pharmacy student, was the son of Dr. P.B. Myers of Denver. On July 10, Marian died in the apartment of Mrs. Hazel Brown, the cook for Myers' fraternity house and "the only person of mature age in the house during the 24 tragic hours preceding the girl's death." Young Myers was charged with murder in Marian's death, and could have faced life in prison if convicted. Dr. Roy Emanuel testified that Myers consulted him about a possible pregnancy but had asked for advise, not for an abortion. Emanuel said that he'd recommended a test to verify the suspected pregnancy, and had also told the young man to consult with his father. "Two or three weeks later he came back ... bringing the report, which showed the girl was not pregnant." Myers had Marian with him, and she said that she wanted an examination, because she didn't think the test was accurate. He did examine her and while he could not definitively say, he didn't think she was pregnant. The couple returned again the Thursday before Marian's death, and this time his examination verified that the girl was pregnant. Again, Emanuel said, he referred the couple to Myers' father. Mrs. Brown, for her part, said that Myers had loved Marian and had wanted to marry her. He was opposed to the idea of an abortion. Marian, on the other hand, insisted that her parents would never accept Myers. Brown said that Marian had taken "a harmless drug" and that this was the only attempt that she personally knew of to abort the baby. But evidently Marian had found an abortionist, or had done something herself more drastic than just take mild abortifacients, because doctors who examined her said that some sort of instruments had been used in the abortion that had caused her death. Myers was supported by Brown, his father, and his fraternity friends during the trial. There were tears of joy in the courtroom when he was acquitted. Marian's father, Professor M. Elbert Mills, "maintained a strict silence." And I've found no mention at all of any further investigation into the death of his daughter. The summer of 1926 left police unraveling a mystery. On July 13, 1926, a laborer on his way to work stumbled across a grisly find: the dismembered remains of a young woman, tossed along the side of a lonely road between two cemeteries near Boston. Boston police began their investigation, but had little to go on. Parts of the body were packed into two cardboard boxes, "tied by window cord in sailor knots." More of the body was in a burlap bag. Other parts of the woman's body were wrapped in Boston newspapers dated June 27. "A pair of nile green hose and a white cotton nightdress, with a pink ribbon, the only clothing found, offered no clew to her identity," the New York Times said. Dr. Leary, the Boston medical examiner, said that the young woman was approximately 25 years of age, 5'6" tall, weighing 120 pounds, with bobbed black hair and dark brown eyes. She had evidently been dismembered shortly after her death, Leary said. The dismemberment was expertly done, Leary said, indicating that the killer might be a skilled surgeon. Leary estimated that the young woman had been dead from 48 to 72 hours at the time of autopsy. Leary also did not at first release a definitive cause of death. He said that "blood poisoning" was likely and indicted that, as the New York Times said, "evidence pointed to illegal surgery,"
"The only indication as to the identity of the murderer came from young men who saw a well-dressed, middle-aged man nervously driving an automobile in the vicinity" the previous night. Nearly twenty families of missing women contacted the morgue in the first hours after the body was found, but the descriptions of their loved ones did not fit the victim. Police provided pictures of the victim to local papers for publication to aid in identification of the woman. By July 15, the young woman had been positively identified as 20-year-old Edith Green, who had been an attendant at the Boston Psychopathic Hospital. Another employee, Bessie Landry, identified Edith by photographs of the victim and by describing a mole and her dental work. Edith had been raised as a ward of the state, along with her two siblings. She got a job at the Boston Psychopathic Hospital as a day attendant on April 26, 1926. But the night of June 23, she left, never to return. She was next tracked to lodgings in Roxbury, where she took a room on July 8 and left her belongings there. "That same night," the New York Times said, "a young man called for her and took her away with him. She was never again seen alive." Police began a search for the young man, who had obtained a marriage license for himself and Edith on July 3. "Policeman visited the home of William J. Ford in South Boston," the New York Times said, "and took him and his brother and father to the morgue for questioning. Ford's mother collapsed when the police took her son into custody." Later reports indicate that 21-year-old James V. Ford, evidently William J. Ford's brother, was the "sweetheart" responsible for Edith's pregnancy. Ford admitted to police that he had arranged for an abortion to be performed on Edith by Dr. Thomas E. Walsh. Ford said that Walsh had asked for his help in disposing of Edith's body, but that he had refused. Walsh and his wife were charged with murder in Edith's death. The search for culprits in Edith's death also netted a thoroughly intoxicated Dr. John Leo Hanson, who admitted to having been in Boston when Edith vanished, but who denied having any part in her death or dismemberment. The days of ditching the body have largely passes with legalization of abortion -- one can only assume. After all, abortion itself is no longer a crime, and an abortion death is considered no more remarkable than any other death attended by a physician. However, in 1993, a California pre-teen managed to guide her aunt to the last place the child had seen her mother. The pair found illegal abortionist Alicia Hanna and an ex-employee stuffing the body of Angela Sanchez into the trunk of her own car, which they were planning to ditch in Tijuana. This raises the possibility that Hanna wasn't the only post-Roe criminal abortionist to get the idea to elude discovery by hiding the body. Perhaps she is just the only one that got caught. On July 8, 1929, 26-year-old Frances Rogers died from a criminal abortion. The source summary says that the abortion was done in an unknown location, but the description of the offense says that she died at the scene of the crime. The person responsible was never identified. Junette Barnes, a 27-year-old mother of four, had a tubal ligation on June 16, 1988. One week after this operation, she found out that she had been pregnant at the time of the surgery, and was still pregnant. She saw her family physician, Dr. Ted Shields on July 8, 1988, and he performed a safe, legal abortion on her at Surgicare Outpatient Center in Victoria that day. During the abortion, he perforated her uterus and cut an artery and several veins. Junette was transferred to a hospital, where she died of blood loss during emergency surgery. On July 2, 1982, 23-year-old Darlene Wood was put under anesthesia for a second trimester abortion at Temple University Hospital. The abortionist was Renga Rajan; the anesthethesiologist was William Stevenson-Smith. Darlene was given nitrous oxide by face mask. She started coughing after the procedure began. After the abortion was completed, she was admitted to the respiratory intensive care unit, where she was diagnosed with primary pulmonary hypertension. Over the next several days, Darlene experienced increasing respiratory distress. She was given medication to maintain her blood pressure. But on July 7, Darlene went into cardio-respiratory arrest. She was pronounced dead at 2:50 p.m. The administratrix of Darlene's estate contended that the lack of appropriate medical and anesthetic clearance was a substantial factor in her death. Rajan was also successfully sued for the 1987 abortion death of Iris Velazquez. On July 6, 1930, Mary Tulis, age 34, died in Chicago from complications of an abortion. She died at the scene of the crime. Marie La Montagne, who lived at the scene, was fingered in the abortion. Dr. O.W. Sommer of Francis Willard Hospital had been brought to the scene by somebody when it became apparent that Mary had peritonitis. Neither Montagne nor Sommer is mentioned in the coroner's verdict. Pearl Schwier, age 42, was 20 weeks pregnant when she sought a safe, legal abortion at St. Luke's hospital in New York City. She was brought into the operating room on July 6, 1970 for a hysterotomy abortion, which is simply a c-section in which the intention is to allow the baby to die rather than to deliver him or her alive. It was performed under general anesthesia. About 45 minutes into the procedure, Pearl had a reaction to the anesthesia and died. During the first two thirds of the 20th Century, while abortion was still illegal, there was a massive drop in maternal mortality, including mortality from abortion. Most researches attribute this plunge to improvements in public health and hygiene, the development of blood transfusion techniques, and the introduction of antibiotics. Deaths continued to fall as the century went on, with nary a blip on the line with legalization. Learn more here. On July 4, 1913, 33-year-old Mary Goldstein died in Chicago from an abortion perpetrated by Minnie Bernstein. Bernstein is identified only as "abortion provider", so she might have been a lay abortionist. She was held by the Coroner, and indicted by the Grand Jury for felony murder on September 1, but the case never went to trial. "The community around Oyster Bay are greatly excited over an abortion case that has been brought to light." The woman, Miss Bertram, was engaged to a New York man. The wedding was to take place on July 4, 1875. But Miss Bertram became pregnant before the wedding. She purchased an abortifacient which didn't have the effect she desired, so she took some other sort of abortifacient. Miss Bertram herself took ill and died a few days later. The physician who was attending her declared the cause of death to be the abortion. Miss Bertram's fiance denied being the father of the dead baby. "There is a suspicion entertained of another young man". Police began an investigation into who he might be, and into who sold Miss Bertram the fatal drugs. This unfaithfulness to her fiance certainly explains why Miss Bertram didn't want him to know about her baby. On July 2, 1900, Mrs. Sarah Bonda, age 20, died at her home as a result of a criminal abortion performed on her there that day. When police went to arrest Mrs. Martha Heisig, a midwife, in connection with the death, she committed suicide. On Saturday, July 1, 1882, Gussie Ellergood of Carlisle, Illinois, died in a St. Louis hospital. She had been admitted the previous Wednesday after having taken sick. Her death was due to a botched abortion. Gussie was a servant working in the home of Dr. Edgar Park. She made a deathbed statement naming Dr. R. McWilliams as her abortionist, though McWilliams denied any knowledge of her. On July 1, 1936, Madell Williams died in a Rocky Mount, North Carolina hospital, from peritonitis caused by a criminal abortion that had been arranged by her lover. Learn the full story here. "Audrey" is one of the women Life Dynamics identifies on their "Blackmun Wall" as having been killed by a safe and legal abortion. Audrey was 44 years old when she underwent a first-trimester abortion in New York on July 1, 1971. During the abortion she went into cardiac arrest. Attempts to revive her failed; she died that day, leaving three children motherless. Sheryl Cottone was 23 years old when she underwent a first trimester abortion in June of 1981. She was rushed to Veteran's Memorial Hospital in Waukon, Iowa, on July 1. She was pronounced dead on arrival. An autopsy found that she had died from an embolism that lodged in her heart.